The 1200 calorie diet plan is one of the most significant ways to fight unwanted weight gain. This effective plan helps you to lose up to 20 pounds in 90 days. It’s a great way to lose weight without starving or missing out on the necessary nutritional values. With the 1200 calorie diet plan, you get to fight weight gain healthily. You do not miss out on any meal to avoid excess craving for extra calories. Coupling the 1200 diet meal plan with daily exercise is the best weight loss remedy to engage in. As a general rule to lose weight, you have to eat less but healthy. This is the exact idea the 1200 calorie diet plan aims to help you achieve. Although 1200 calorie diet plan aims to help you save calories, you do not have to skip meals. The result of skipping meals is that you end up eating more than necessary. When you skip meals, you tend to get extremely hungry which disrupt your goal of 1200 calories per day. Instead of skipping meals, you should divide the calories up throughout the day. You may divide it up to be 400 calories for each of the three meals in a day. You may also decide to have it as 350 calories per meal, with a 150 calorie snack. Choose a suitable pattern of eating that suits your schedule for each day. The 1200 calorie diet plan does not permit you to consume sugary sweets, carbonated or alcoholic drinks. You can make it a goal to consume 3 cups of low-fat dairy daily, it contains protein and increases your satiety. 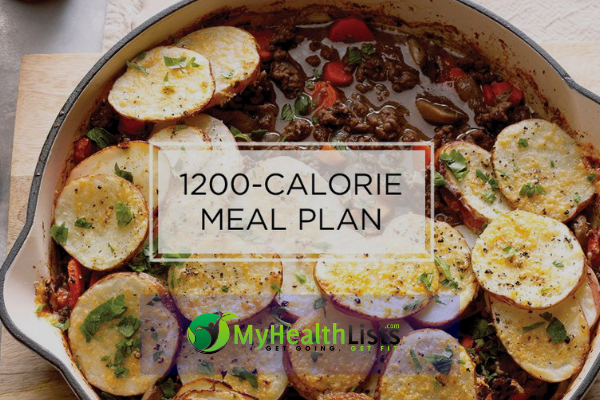 This plan aims to restrict your daily calories to 1200 calories which is why you have to be very picky over how you select your food. You can take non-starchy fruits and veggies. Veggies like carrots, tomatoes, cucumber, leafy greens and fruits like grapes, apples, peaches, banana, and others are great options. Carbohydrates are required in few quantities. Use oils that have less saturated fat like mustard oil, olive oil, canola oil, vegetable oil, mustard oil, and peanut oil. The basic diet you should make sure to consume well is protein. It has so much benefit in helping you to ward off unwanted weight. Avoid saturated, trans fat and unhealthy oils. They cause you to gain weight due to a high level of calories and fat in them. These food items include margarine, cheese, red meat, butter, and others. Avoid consuming fried foods such as potato fries and fried chicken. The 1200 calorie diet plan is not open to aerated and artificially sweetened or carbonated drinks. The packaged juices and beverages contain artificial sweeteners and additives which can cause you to gain weight. Avoid the intake of alcohol; it raises blood sugar which may be detrimental to your health. The 1200 duet plan has excellent recipes that are essentially great for weight loss. Fatty Foods That Will Not Make You Fat!